I had a lot of those drawers – and truthfully – still do, but I can’t overstate enough the benefits my recent organizational efforts have brought me. So what I’m trying to say is: no one is more qualified than me to give organization advice. It’s: I’ve been there and have trolled the Internet for months searching for ways to make my life more ordered and with less drawers, and now I share these storage tips with you. 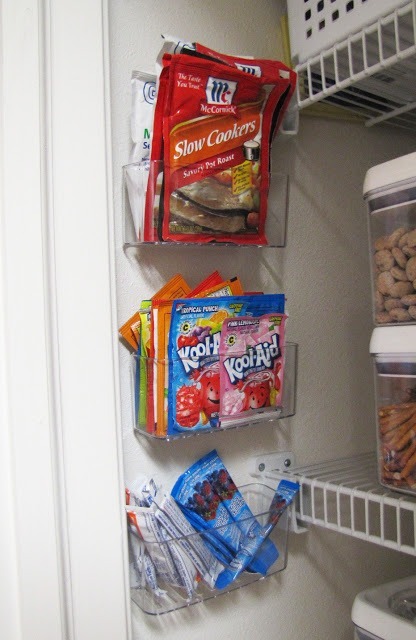 (the ones you put in your kitchen sink) to the back of your pantry door with adhesive strips or velcro and store those thin pantry items like spice packets, hot chocolate or juice powder packets. to hold your plastic grocery bags. Throw it under the sink and next time someone asks for a bag, you’re not reaching into a huge pile of crumpled bags to find one. You can also use a cardboard paper towel tube to hold and dispense the bags, or a diaper wipe container. and use it to organize your pot lids. The right size rack held in place with command strips can also organize your paper goods (baggies, paper plates, aluminum foil, etc.). to store coloring books and art supplies. Stack the books as you would plates between the prongs and put markers, pencils, and crayons in the utensil basket. This handy notion can also be used to store files upright (or bills). and use it to hold spray bottles just under the nozzle. This clears space on the floor of your sink for whatever else you have done there. Just be sure to get a heavy-duty rod or install a wood dowel if you’re hanging a lot of bottles. (found at thrift stores or reclaimed materials stores) and hang it (or lean it, I suppose) on the kitchen wall. Use it to store messages, school reminders, cards and keys. Use cute clothespins to secure the more flimsy items and attach hooks to the side for keys and other small hanging items. (I found the best ones for this purpose are pitcher-shaped with large handles) and line them up in the refrigerator. Store fruit, vegetables, yogurt, and other small food items inside and your kids can just pull out the basket and help themselves. to the bathroom wall so the opening faces the room and store rolled-up towels side by side. to the spot underneath your bathroom mirror and position it so the caddies face up. Now you’ve got plenty of spots to store makeup, brushes and hair products. to organize toothbrushes, floss and toothpaste in the kids’ bathroom drawer. It keeps unsightly toothpaste globs to a minimum, too. (baby food jar lids are perfect) to the underside of a table or shelf and fill the corresponding jars with screws, nails, nuts and bolts…you get the idea. Screw the jars to the lids and you can see your whats-its when you need them and they’re just an easy unscrew away. This handy and popular storage idea also works in craft rooms or wherever you tend to accumulate a lot of little things you need to corral in one place. to organize and store all your batteries. The box accommodates all sizes and you won’t have to deal with a drawer full of mismatched batteries scattered everywhere. and other common garage items. This one is obvious and used often, but it bears repeating because peg board is a master organizer. You can also use it in the kitchen for a message center or above a desk in the kids’ room to hold containers of pencils, markers, scissors and other items. to the playroom wall and use them to hold stuffed animals, blankets, etc. commonly found at home good or hardware stores to “park” your kids’ Matchbox cars and other small metal toys. 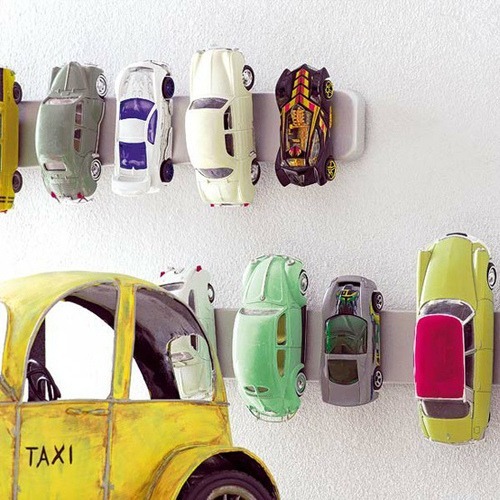 Even better, attach the strip to the wall and teach your child to clean up the cars simply and easily. to the back of the door or closet and use its various compartments to store barbies, dolls, cars, and more. 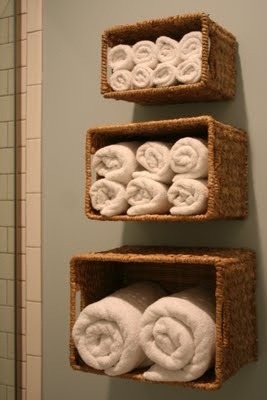 I love this for the laundry room or garage, too. to store beads and other little craft items your kids use often. All the containers are stored vertically, which frees up space. It keeps the boots off the closet floor where they just get bunched up and dusty and lines them up for easy retrieval. 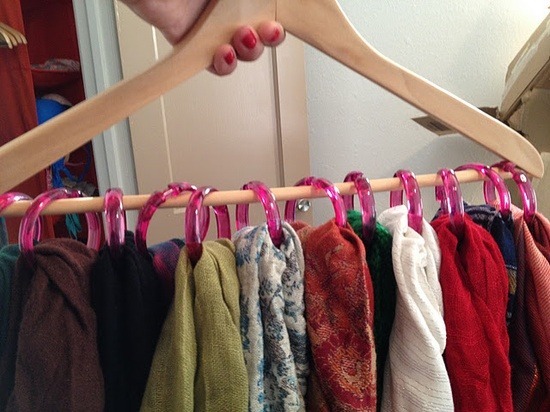 and use the rings to hold your silk scarves. and one near the bottom and use them to secure long wrapping paper rolls vertically. You can also use wire shelving. So many cool storage ideas to implement and almost none of them involve shoving stuff in a drawer, so win-win! Also, the end to the funny story above? 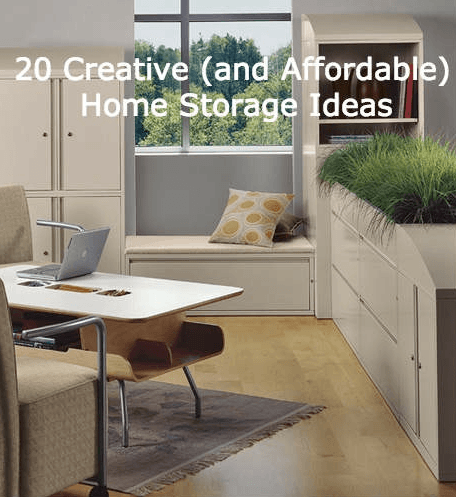 Do you have any creative storage ideas you would like to share?